Whether you like it or not, the condition of your teeth will more than likely be judged when you meet a new person, as reflected in a series of new studies that have been released. One found that three-fourths of the people surveyed held the quality of a person’s smile in higher regard than the type of career they had, the model of vehicle driven or the person’s style of dress. With that in mind, if you have stained and discolored teeth and desire to make positive first impressions, then your dentist is here to discuss the different options available for teeth whitening. In doing so, he’ll reveal which method is the most effective in perfecting the look of your ivories. Are Over-the-Counter (OTC) Whiteners Effective? When you go in to visit your cosmetic dentistry expert for teeth whitening, you’ll have two options to choose from – Sinsational Smile and ZOOM! Both are highly effective methods of delivering professional-strength results. You can expect to leave your dentist’s office with your teeth up to 10 times brighter than when you first walked in – all in one visit. Quality Difference – One of the main differences between OTC’s and in-office whitening is the quality of the ingredients. Your dentist will be using the highest grade of professional-strength bleaching agents, while the kind you get from your local store will be more diluted. 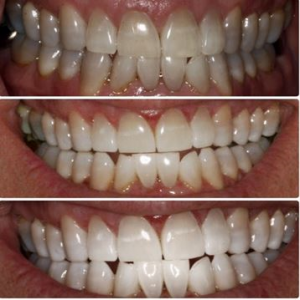 Effectiveness – Because you get a less concentrated application with OTC’s, you won’t be able to duplicate the results that are seen when your teeth are professionally whitened. Time – You can also expect a much longer treatment process to get less effective results when you use store-bought whiteners. Whereas the in-office method will transform your smile in just one visit, you will need to apply your OTC version for at least 10 days to start seeing any noticeable results. By far, the in-office method is the superior route to take, but it offers more than just better results. One of the important features of teeth whitening using the Sinsational Smile or ZOOM! method is that they’re much safer. One of the main concerns with any whitening procedure is the protection of your soft tissues because the bleaching agents can cause irritation. With the aforementioned techniques, though, your dentist and staff will make sure that your gums and lips are secured, and that no saliva mixes with the whitening gel, which can hinder results. When you go in to consult with your local dentist, you can learn more about these two highly effective methods of whitening your teeth. You’ll no longer have to live in shame or worry about what people think of your smile, because your brilliantly gleaming teeth will steal the show! A graduate of Georgetown University School of Dentistry, Dr. Larry C. Young has been caring for patients for over four decades. Still, he enjoys seeing smiles on the faces of happy patients while encouraging them to actively participate in their oral care. For more information about his services, you can contact Dr. Young through his website.